Over the night of 14th - 15th of November 1940, Coventry Cathedral was reduced to ruins in the second world war as part of what was later named “Moonlight Sonata”. The morning after, Provost Howard stood in the chaos and destruction of the cathedral and spoke the words ‘Father Forgive’, which today are inscribed above the remains of the altar. This great act of reconciliation has come to define the city of Coventry’s ability to triumph in the face of adversity. 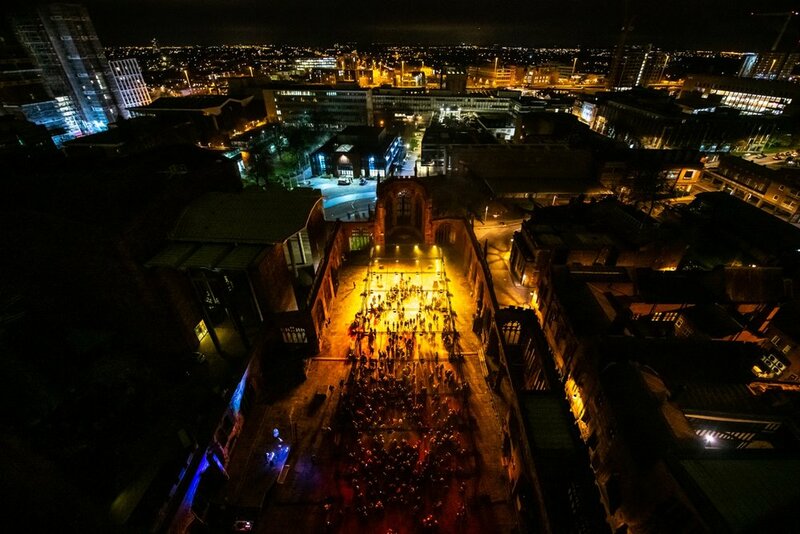 Launched New Year’s Eve 2018 and running until the 13th of January 2019, Coventry Cathedral Ruins was transformed into an ethereal dream-like landscape describing a Sunrise. A Sunrise was used as a metaphor to talk about the heritage of the site, Coventry’s future as City of Culture 2020 but also for the viewer to contemplate their own year to come. The artwork bathed visitors in waves of light describing the pivotal moment of transition from night to day. The light installation was accompanied by an atmospheric, electronic soundscape entitled “Sunrise Sonata” by Andy Spackman and Anna Palmer which was commissioned specifically for the installation.